An elaborate monument to honour a member of the local aristocratic family, Alice, Duchess of Suffolk, who died in 1475. This is one of the most detailed and decorative late medieval tombs in the country. The alabaster effigy of the duchess shows her wearing a coronet and a plain gown with the badge of the Order of the Garter on her left sleeve. She is laid out on a tomb chest decorated with carvings of angels. Her pillow is supported by more angels. The grand canopy of the tomb is decorated with angels, rimmed by a border of quatrefoils and oak leaves, and crowned by more angels perched on tall pinnacles. 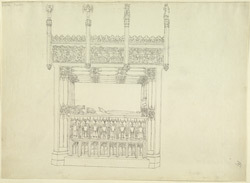 The canopy was added later in the 15th century after the tomb was already installed.